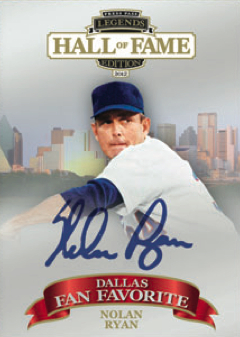 2012 Press Pass Legends Hall of Fame Edition brings together several sports for a high-end, all-autograph release. Every tin comes with four autographs, all but two of which are Hall of Famers. The pair who aren't: Andrew Luck and Robert Griffin III. 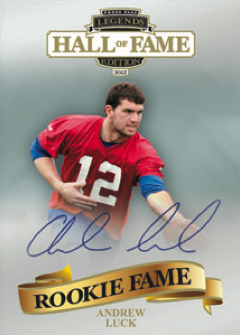 Most of the players in 2012 Press Pass Legends Hall of Fame Edition are baseball and football players. Among those confirmed for the set are Nolan Ryan, Larry Bird, Rickey Henderson, Jack Nicklaus, Stan Musial, Ozzie Smith and Randy Couture. In total, there are 50 different signers. Babe Ruth, Ty Cobb and Jackie Robinson are among those on randomly inserted cut signature cards. All cards are numbered to 99 or less, including four parallels numbered to 10 or less. Collectors can also look for inscriptions, printing plates and red ink versions. 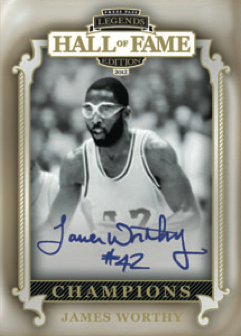 2012 Press Pass Legends Hall of Fame Edition cards are printed on holofoil stock. Every 12-box case comes with a hot box that includes six autographs instead of the promised four. Cases also have an autographed baseball from a list of players that includes Greg Maddux and Chipper Jones. 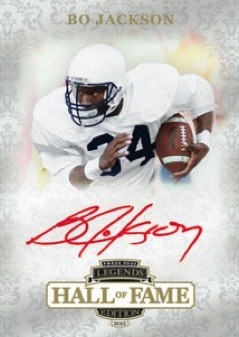 2012 Press Pass Legends Hall of Fame Edition is a hobby-only release.